In celebration of Mother’s Day, Baskin-Robbins, the world’s largest chain of ice cream specialty shops, is introducing an attractive lineup of ice cream cakes for that special woman in our lives. Baskin-Robbins offers a wide range of stylish and eye-catching ice cream cake designs made from premium ice cream and a layer of delicious moist cake. 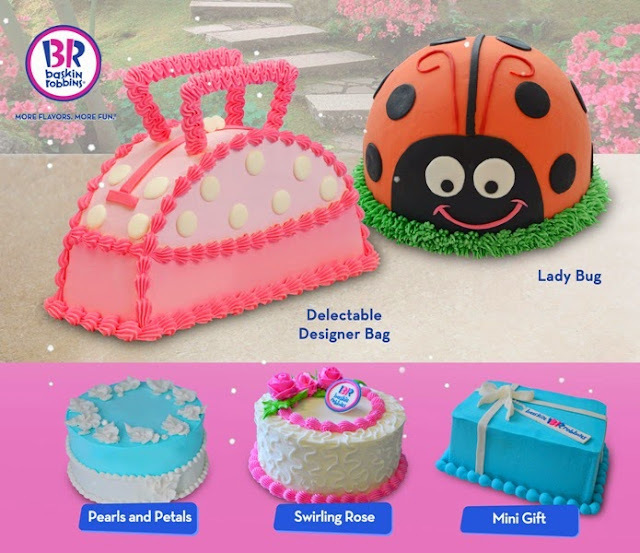 From the Delectable Designer Bag and Lady Bug cakes to the Pearls and Petals, Swirling Rose, and Mini Gift cakes, Baskin-Robbins’ ice cream cakes are designed with every mother’s special qualities in mind. Whether your mother is a fashionista at heart, fun and playful or simple yet elegant, Baskin-Robbins has a cake for her. Guests can also choose to have their ice cream cakes customized with any ice cream flavor of their choice. Or a personalized message could be added on top to show how much you love your mom. In line with the special treat for moms, Baskin-Robbins is also highlighting one of its all-time best sellers, Pralines N’ Cream as the flavor of the month for May. This classic ice cream flavor is made with vanilla flavored ice cream with praline-coated pecan pieces and a caramel ribbon. Pralines N’ Cream can be enjoyed in a cup, cone, milkshake or two-scoop sundae. To know more about Baskin-Robbins’ range of ice cream flavors and frozen desserts, visit Baskin-Robbins shops at the Central Square, Bonifacio Global City; Greenbelt 5, Makati; Fairview Terraces and Trinoma Mall in Quezon City. For more information about Baskin-Robbins; visit www.baskinrobbins.ph or check out their Facebook (facebook.com/baskinrobbinsph), Twitter and Instagram (@baskinrobbinsph) accounts. Baskin-Robbins was founded in 1945 in Glendale, California by Burton Baskin and Irvine Robbins, ice cream enthusiasts and brothers-in-law, whose passion inspired what is now the world's largest chain of ice cream specialty shops. As of 2013, Baskin-Robbins has 7,300 shops in nearly 50 countries, with the U.S. having the largest number with 2,500 ice cream stores. Today, Baskin-Robbins is the world’s largest chain of ice cream specialty stores, serving over 300 million customers each year worldwide. For more details about Baskin-Robbins, visit their website www.baskinrobbins.ph or check out their Facebook (facebook.com/baskinrobbinsph), Twitter and Instagram (baskinrobbinsph) accounts. MAYBELLINE MAKE-UP MADNESS SALE GIVEAWAY! Win 1 year’s worth of all-new Pampers Baby Dry!